Ok, so this post actually has nothing to do with off roading or my Jeep that was totaled which is in the picture. 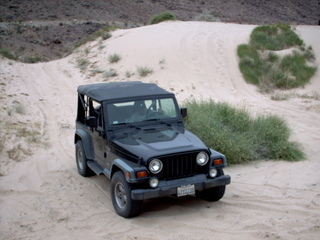 It just made me think about my old Jeep and I wanted to tell you all how much I still miss her. Anyway, so what is 4X4? It was started earlier this year by Alvin and Lori as a way to get to know some other couples at church better. Each couple takes a turn planning the date. At the end of 4 months, each couple picks 3 other couples to join them and it continues to multiply. So this past Sunday night was our first 4X4 experience going out with the Alvin and Lori Velarde, Bart and Lindsey Boulton, and Richie and Selena Garcia. We had dinner at P.F. Chang’s and had a great time sharing stories and getting to know each other better. Afterward we walked across the street to the ferris wheel at The Pike. Little did we know that Rachel and Lori couldn’t ride because they were pregnant. Are you serious? I mean I can understand a roller coaster, but a ferris wheel? It’s like an elevator that makes you a little dizzy? Regardless, we had a great time together. Sorry, didn’t get any pictures so you’ll just have to enjoy the memorial to my Jeep up above. So next month we do it again and it’s mine and Rachel’s turn to plan the date. We want to do something really fun and creative or different. Any idea’s? Yay! What a rad idea. You guys rock, and I think we might need to steal this date idea. What about doing a scavenger hunt? You should take everyone to play putt putt! Los – thought of that one…but my Wife already vetoed that option. Hey Bobby, thanks for the blurb on the blog. We had a great time too, and I’m hoping that the 4 x 4 fever catches on in a big way. There is no pressure to do something creative. Hanging out at the homestead is fun too. If you are looking for ideas though, do a google search and type in “fun things to do in Long Beach” or Orange County, etc. There are websites out there with great ideas. it has to be your idea, not your reader’s..